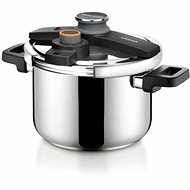 Great kitchen additions for quick yet gentle cooking with maximum energy savings. 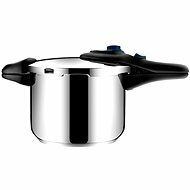 Tescoma pressure cookers feature high or low pressure cooking with BIO EXCLUSIVE +, allowing you to conveniently control the pressure inside the pan. 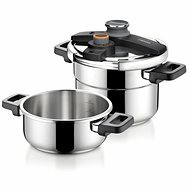 The containers are made of high-grade stainless steel and their three-layer sandwich bottom allows use on all heat sources - gas, electric, glass ceramic and induction. Tescoma is also concerned with your safety. 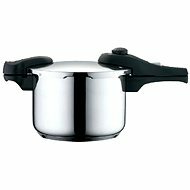 The pots are fitted with four fuses and solid handles that do not burn under any circumstances. 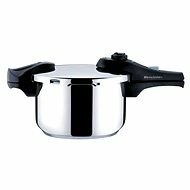 Tescoma pressure cookers offer a combination of the finest quality and excellent prices that will surely enchant even the most demanding chef! Induction, Gas, Glass-ceramic, Electricity Done! 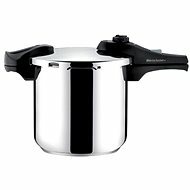 For shipping to other EU countries visit this page Tescoma Pressure cooker BIO EXCLUSIVE + DUO 4 and 6l. Für Versand nach Deutschland, besuchen Sie bitte Tescoma Schnellkochtopf BIO EXCLUSIVE + DUO 4.0 und 6.0l. Chcete doručit zboží do Česka? Prohlédněte si Tescoma Tlakový hrnec BIO EXCLUSIVE + DUO 4.0 a 6.0l 701710.00. Chcete doručiť tovar na Slovensko? Prezrite si Tescoma Tlakový hrniec BIO EXCLUSIVE + DUO 4.0 a 6.0 l. Für Versand nach Österreich, besuchen Sie bitte Tescoma Schnellkochtopf BIO EXCLUSIVE + DUO 4.0 und 6.0l.